Writer-director Eli Roth is in Toronto and on Monday, July 31, he appears at TIFF Bell Lightbox to present a screening of Umberto Lenzi's cult horror film Cannibal Ferox (also known as Make Them Die Slowly). Eli Roth was the writer and director of Cabin Fever, Hostel and Hostel: Part II. He also acted in those films as well as others such as Inglourious Basterds and Piranha 3-D. Roth has been in Toronto shooting the the werewolf series Hemlock Grove for Netflix. Roth says, "I love the Italian cannibal sub-genre from the late seventies and early eighties. The two undisputed maestros of the genre, Ruggero Deodato and Umberto Lenzi, battled back and forth to reign supreme as the Cannibal King. 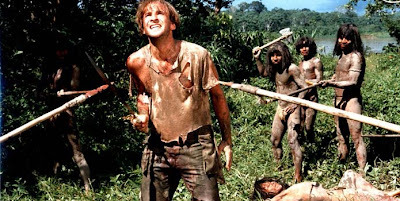 I've shown Deodato's Cannibal Holocaust lots of love in the past (Deodato even did a cameo as a cannibal in Hostel: Part II), but I also want to show my appreciation for the great Lenzi and see how grisly and visceral his work looks projected in 35mm. I've never seen this film projected, so for me it will be like seeing it for the first time as it was meant to be seen, in a theatre with an audience full of horror fans, in all its uncut Italian glory." The film will be presented in its uncut version. Viewer discretion is advised as the film contains scenes of extreme violence.